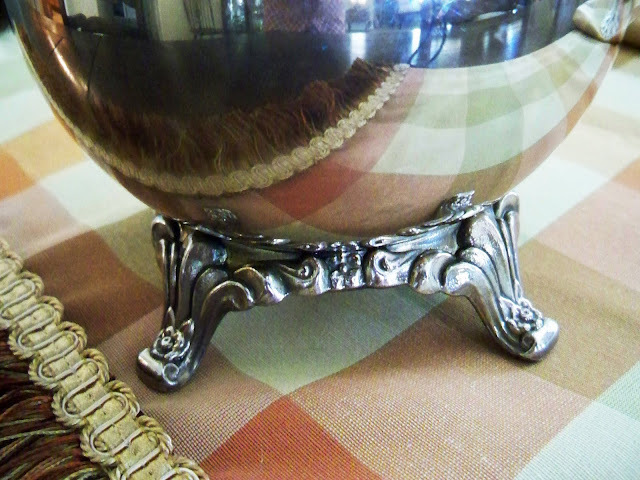 I think every home needs a little gold and silver and a little bling to bring sparkle to a room. I found a new treasure and transformed an old one. The GW didn't have much, I think they just had their 1/2 off Sat. sale and the shelves were really empty, but as I hit the last aisle, there sat this wonderful silver piece. 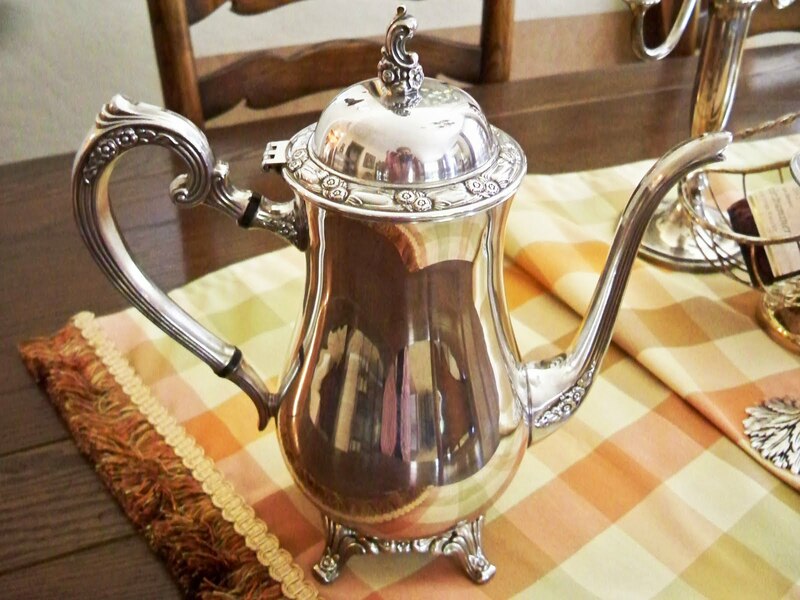 A lovely Oneida silver coffee pot. I loved the detail and the little carved flowers were just so pretty. The little flowers are just everywhere. So pretty on the spout. Even the little feet have flowers. It's a nice heavy weight piece and can you believe $7.99 and then 25% off for Senior Day. Yip-skip!!! 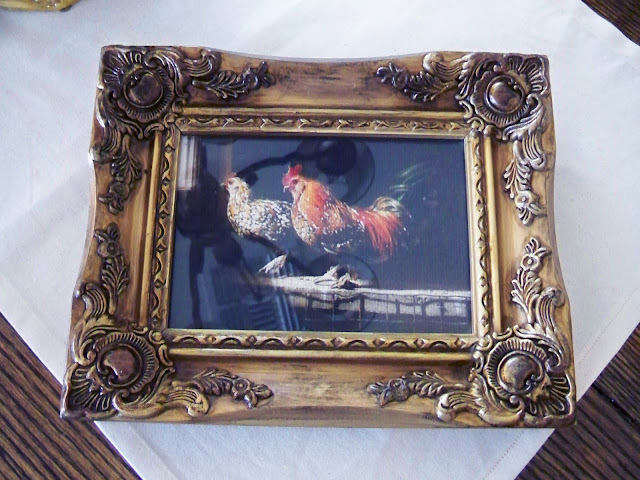 This is a frame that I found several months ago at GW and then used some stain and touches of brown to redo the tacky color. I think it has beautiful details, but it needs some sparkle. Rub 'n Buff to the rescue. Doesn't it look much better. The light makes it look more gold than it really is except for the raised decorations. I also found this wall sconce a few months ago at GW and spray painted it ORB. I thought maybe it could use a little bling too. Much better too. It's always amazing at how this stuff changes something and it takes just a tiny bit. Love it. Fun to add a little sparkle once in a while. If you need some glitz, just get out the Rub 'n Buff and sparkle away. A little gold or silver adds such dimension to anything and seems to bring a room to life. What a lovely teapot! Lucky find-I think I should start haunting the local Goodwill! What a great tea pot Marty! LOve what you did to your frame and bracket.They look terrific. Hey, I think I need a little Rub n Buff.... for ME! I feel like I could use a little bling or sparkle lately...!! I repainted a mirror in black plum then used antique Rub& Buff to jazz it up a bit. One gal whose blog I visit is always painting over anything she buys that has gold on it but I think a bit of sparkle is necessary to keep everything from looking too flat and to capture the light in a room. Love your pieces. They all turned out well. I love what you did! Rub n' Buff Patina is also fun to work with! You got a great deal on the coffee pot! Don't ask me why, but my Goodwill store only sells junk that looks leftover from yard sales, yet the prices are close to what you'd find new in the store. Okay, maybe not that high, but it feels like it. A pot like that would have been terribly tarnished and missing the handle and top and would have had a $25 to $30 price tag. I don't know where you girls shop, but I think I need to go shopping with you to find these good deals! What a wonderful teapot -- and the price -- WOW!!! Nice job on the frame as well and that wall piece did need a little bling didn't it!!! Great deal on the teapot, Marty! And the touches you added to the frame and the bracket really add an extra dimention! I wish I could find nice silver like that at our local GW. Nope, nada. Great deal! 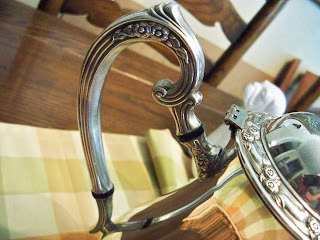 I have never used rub 'n buff - but I need to get me some, you really made your items beautiful! And that teapot is great! Thanks so much for sharing! That is a gorgeous find Marty. You really did shiner her up nicely too. Cute roo pic. Pretty teapot and I love the way you shined it up! 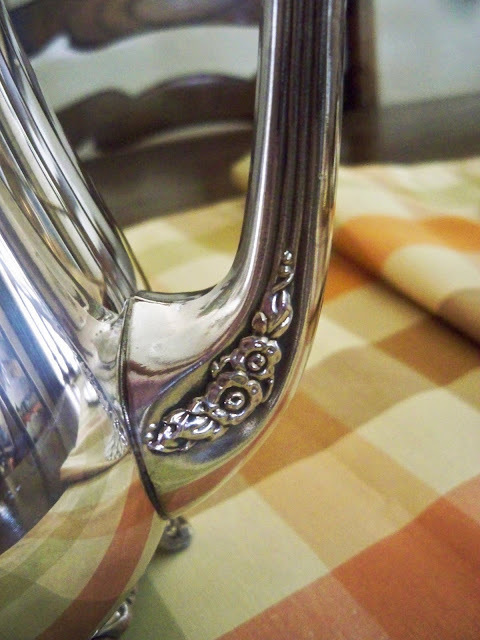 I think it is sad that very few people love and use silver these days. But if they did it would not show up at the SA for a good price. I am glad you have it, love it and will use it. Fun! Richard from My Old Historic House. Love the extra bling that Rub 'n Buff gives a piece. That stuff is magical! Oh, that coffee pot is a real beauty! I love the feet. Both of your redos are so pretty Marty! I haven't tried the Rub'n buff but wil soon! You have a way of transforming things!! You have inspired me to find my nearest Goodwill store and see what treasures I can find. I just love Rub n'Buff, it has rescued lot's of stuff around my house. Your roo picture is fabulous! Great teapot!! I just love Rub n'Buff. I've used it quite often myself! I like that frame even better with the Rub N Buf you did, Marty! Very pretty detailing! Great coffeepot ~ those flowers are a nice touch, especially on the spout. great great find, teapot is gorgeous and frame and shelf looks awesome. Gosh your Good Will has some good stuff!! Ours just has old clothes, plastic containers (not even as good as Tupperware), and glasses that have Daffy Duck on them...oh, and some half-burned candles. Oh Well. Love the gorgeous silver. I like Rub and Buff too! I does make a big difference! Gotta try that stuff one of these days! What a gorgeous find @ Goodwill! I have some newly ground Creme Brulee Coffee, dear...I'll be right over! Thank for your sweet comment and visit On Crooked Creek. Pretty coffee pot. I'll bet you already have a vignette designed for it. 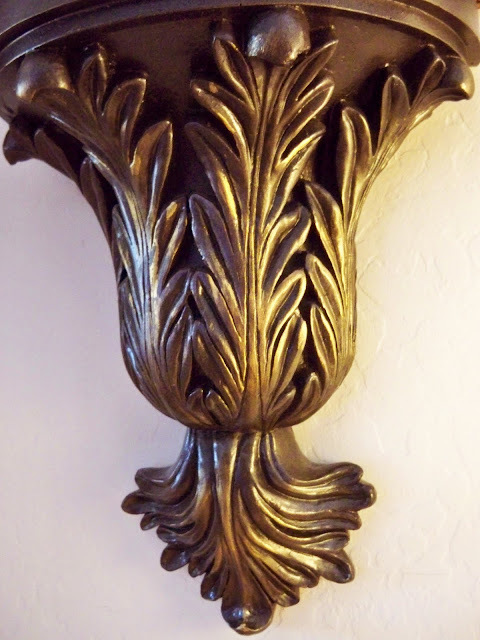 Your frame and sconce look so pretty after the rub and buff. I haven't had any in years. Maybe it's about time I got some. I'm sure there are a lot of things I could "buff" around here. Thanks for the tip and great finds. Fabulous buy on the teapot, Marty. She is so pretty, all shined up and decked out with flowers. I'm going to add Rub n Buff to my list of "gotta have it"! I love the look you achieved using it. Love the teapot. You are still the GW Queen. You always find the best stuff!! Lovely. A little rub and buff and taa daa, brilliant and beautiful! love it. your bling is lovely. The frame turned out great. Big hugs! Great coffee pot. Picked up a little piece this week from my cousins new store...think it might make TTT! What a great tea pot and great price.You have it really shined.I feel so ashamed.I will have to get mine out ofthe closet and work on it. I love Rub'n Buff too! I always keep some on hand for those fix ups and enhancements! I love the silver teapot! Our Goodwill is boring! Mostly stuff that no one wanted. Your frame does look better- personally I love the warmth of golds and bronzes! 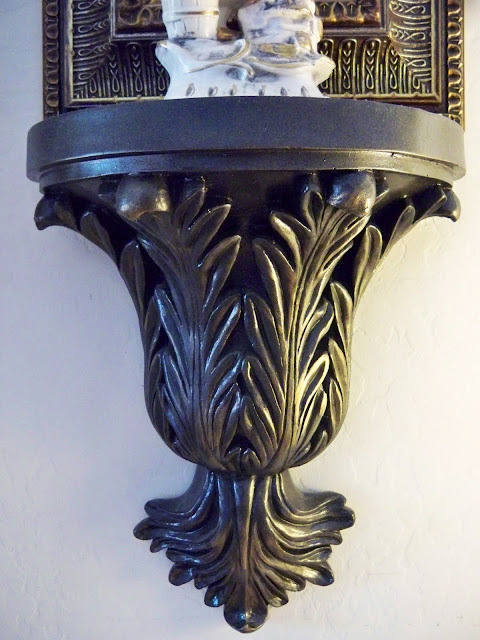 Does anyone know if you can use rub n buff on shiny brass light fixtures to make them look more like anqtique brass? I hope you can buy it at HL because I've never used it, and it looks like just the ticket to add dimension to some things I have painted sort of flat. Love the teapot too Marty, I'm always pulled two ways with silver stuff for my home - I love to see it gleaming but I hate polishing it! So I stick to the few pieces I have and can cope with. I'm totally with you on the 'bling' front, I love rub n buff too, but it's just gold I go for. 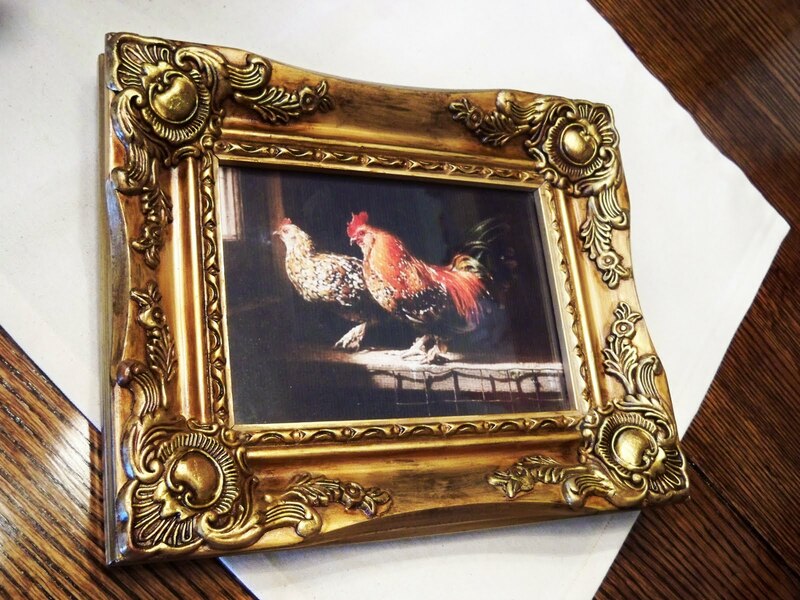 The frame and rooster picture is great, and I love the wall sconce too. The coffee pot is stunning. What a lucky find! Everything looks shiny and pretty! This teapot was a great find Marty Just Beautiful. I also had a great time looking for a Rooster. Now I have one ! !1 I just put him in my Tablescape for this week. I hope you have a great week. You got a steal on that coffee server! Oh my...lucky you! I like the results of your Rub n buff projects. I've never tried it, but I'm always so impressed by the change it makes! I need to make rub and buff my new best friend! Everything looks great! Wow! Your silver teapot looks like a mate to mine. Gorgeous! And do you know that I can't get Rub n' Buff here where I live! Love what you've done with the frame and bracket. Thanks for using AMACO's Rub 'n Buff. 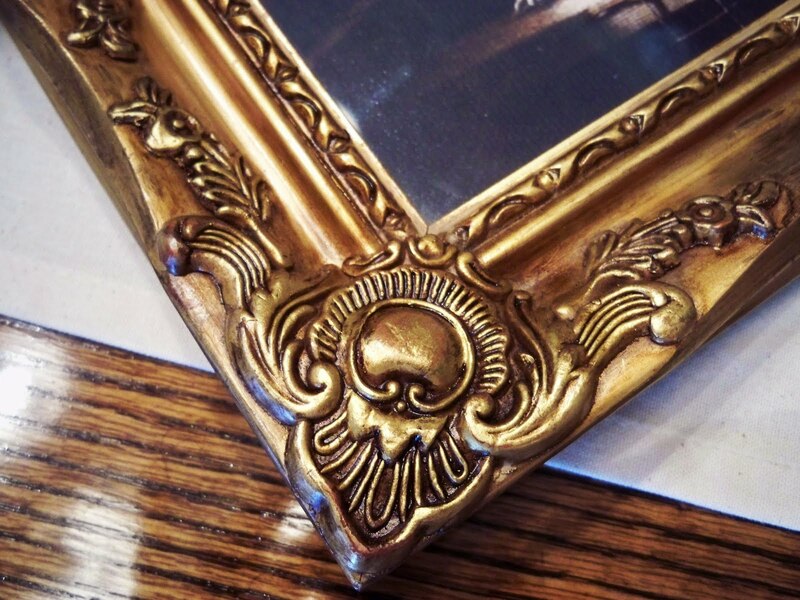 Your frame looks great! We have 16 colors - all available on our website - so you'll have to check them all out.